Requirements were REVISED effective January 1, 2016. Explain to your counselor the hazards you are most likely to encounter while participating in snow sport activities, and what you should do to anticipate, help prevent, mitigate, and respond to these hazards. Discuss first aid and prevention for the types of injuries or illnesses that could occur while participating in snow sports, including hypothermia, frostbite, shock, dehydration, sunburn, fractures, bruises, sprains, and strains. Tell how to apply splints. Explain why every snow sport participant should be prepared to render first aid in the event of an accident. Explain the procedure used to report an accident to the local ski patrol for the area where you usually ski, ride, or snowshoe. Tell the meaning of the Your Responsibility Code for skiers snow-boarders, and snowshoers. Explain why each rider must follow this code. Explain the Smart Style safety program. Tell why it is important and how it applies to participants at snow sport venues in terrain parks and pipes. Explain the precautions pertaining to avalanche safety, including the responsibility of individuals regarding avalanche safety. Tell the meaning of the Wilderness Use Policy. Explain why each skier and snowboarder must adopt this policy. Complete all of the requirements for ONE of the following options: downhill (Alpine) skiing OR cross-country (Nordic) skiing OR snowboarding OR snowshoeing. Show how to use and maintain your own release bindings and explain the use of two others. Explain the international DIN standard and what it means to skiers. Explain the American Teaching System and a basic snow-skiing progression. Discuss the five types of Alpine skis. Demonstrate two ways to carry skis and poles safely and easily. Demonstrate how to ride one kind of lift and explain how to ride two others. On a gentle slope, demonstrate some of the beginning maneuvers learned in skiing. Include the straight run, gliding wedge, wedge stop, sidestep, and herringbone maneuvers. On slightly steeper terrain, show linked wedge turns. On a moderate slope, demonstrate five to 10 christies. Demonstrate the ability to ski in varied conditions, including changes in pitch, snow conditions, and moguls. Maintain your balance and ability to turn. Name the major ski organizations in the United States and explain their functions. Show your ability to select, use, and repair, if necessary, the correct equipment for ski touring in safety and comfort. Discuss classical and telemark skis. Demonstrate two ways to carry skis and poles safely and easily. Discuss the basic principles of waxing for cross-country ski touring. Discuss the differences between cross-country skiing, ski touring, ski mountaineering, and downhill skiing. List the items you would take on a one-day ski tour. Demonstrate the proper use of a topographic map and compass. On a gentle, packed slope, show some basic ways to control speed and direction. Include the straight run, traverse, side slip , step turn, wedge stop, and wedge turn maneuvers. On a cross-country trial (sic - should be "trail"), demonstrate effective propulsion by showing proper weight transfer form (sic - should be "from") ski to ski, pole timing, rhythm, flow, and glide. Demonstrate your ability, on a tour, to cope with an average variety of snow conditions. Demonstrate several methods of dealing with steep hills or difficult conditions. Include traverses and kick turns going uphill and downhill, sidesteps, pole drag, and ski-pole "glissade." Show your ability to select the correct equipment for snowboarding and to use it for safety and comfort. Show how to use and maintain your own bindings, and explain the use of the different binding methods. Explain the need for leashes. Discuss the four types of snowboards. Demonstrate how to carry a snowboard easily and safely. Demonstrate the basic principles of waxing a snowboard. On a gentle slope, demonstrate beginning snowboarding maneuvers. Show basic ways to control speed and direction. Include the side slipping maneuver. On slightly steeper terrain, show traversing. On a moderate slope, demonstrate an ollie, a nose-end grab, and a wheelie. Demonstrate your ability to ride in varied conditions, including changes in pitch, snow conditions, and moguls. Maintain your balance and ability to turn. Name the major snowboarding organizations in the United States and explain their functions. Name the parts of a snowshoe. Explain how to choose the correct size of snowshoe. Describe the different types of snowshoes and their specialized uses. Discuss factors to consider when choosing a snowshoe. Explain how to properly care for and maintain snowshoes. Describe how to make an emergency snowshoe. Describe areas that are best for snowshoeing. Discuss some advantages and dangers of backcountry snowshoeing. Discuss the benefits of snowshoeing. Demonstrate the most efficient ways to break trail, climb uphill, travel downhill and traverse a slope. Take a two-mile snowshoe hike with a buddy or your troop. Demonstrate your ability, on a hike, to cope with an average variety of snow conditions. Snow Sports. 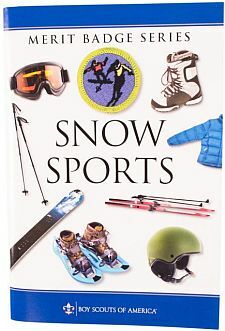 Activities in the field must be supervised by a mature and conscientious adult 21 years or older who is committed to compliance with BSA Winter Sports Safety as defined in the Guide to Safe Scouting.